Add this to the list of things that are cheap here: Antiques. Or, at least, what we Americans would consider antiques. In France, of course, there's a lot of old stuff. From where I'm sitting right now, I can see at least 3 buildings that are older than the oldest building in my hometown, and a few blocks away is an entire neighborhood that predates the United States by a good 200 years. 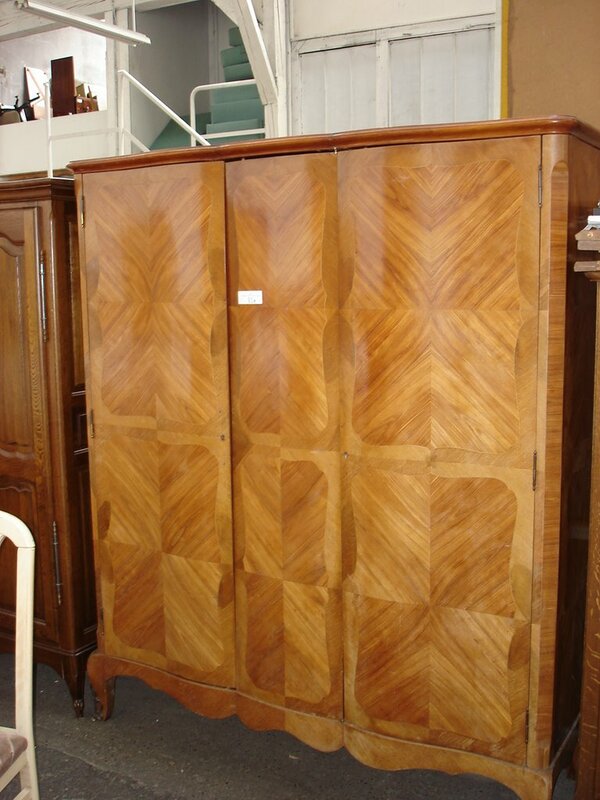 All of this means that there have been grotty furnishings gathering dust in French attics for many centuries. As a result, things in France that are less than 150 or so years old aren't rare at all, and aren't really considered "antiques". They're considered "used furniture". In a crummy neighborhood over behind the train station is La Boite D'Occases (The Box of Used Stuff). On the inside it's very similar to the Carrboro PTA Thrift shop, complete with scarred ping-pong tables and slightly warped copies of Herb Alpert's "Whipped Cream and Other Delights". But in the furniture rooms in back...look, I'm no antiques buff and don't know a Louis XIV chair from Lewis Lapham. But man, there's some good stuff there for dirt cheap. Witness: This marble coffee table (under a really heinous wooden one and next to an equally heinous glass one). Yours for the princely sum of 35 Euros! Not impressed? 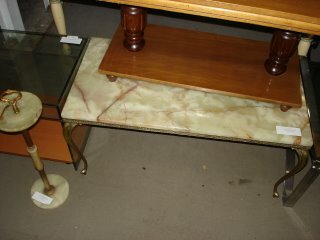 Well, take a gander at the matching marble ashtray that comes with it! Heck, I think that's pretty cool, and I don't even smoke. I might buy it to put my TV remotes on. You can't get a pressboard coffee table at IKEA for 35 baguettes, never mind a marble one with matching ashtray that looks like set dressing from Goodfellas. But we don't need a coffee table; we came to find an armoire. 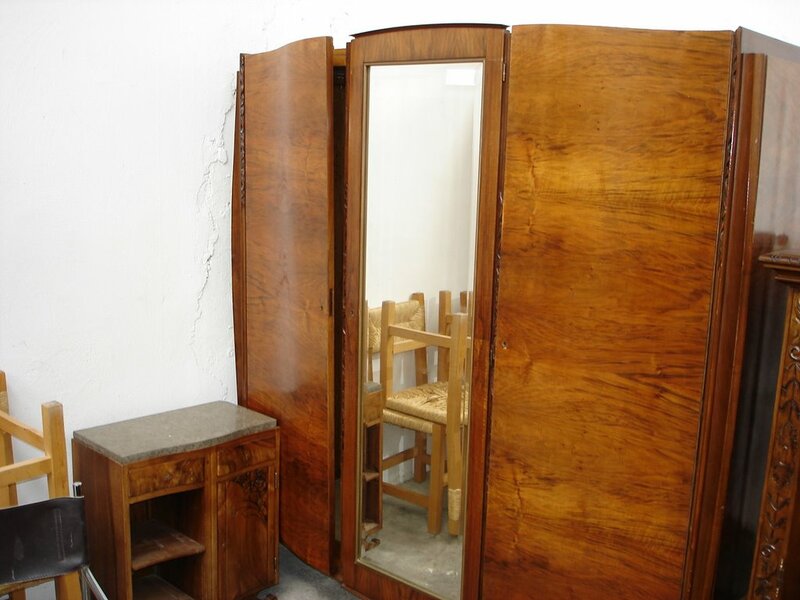 We considered this one wedged back in a corner (with matching tiny nightstand) for 100 euros, but the mirror was a little loose, plus it smelled like old lady. 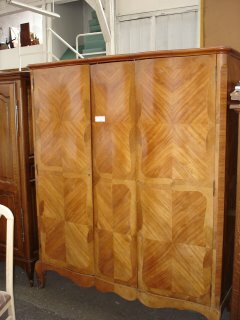 If you want one like this, you can troll eBay for "french art deco armoire" and find one for about $1299, plus 300 for shipping. Or you can go to La Boite and pick up a handsome dot-matrix printer while you're at it. So we bought this one instead. It was listed at 80 euros, but when I fiddled concernedly with a loose hinge, the store guy said he'd go as low as 65. Sold! We paid an extra 30 to have their guys deliver it by truck and schlep it up our 6 flights of stairs (heh heh). It took me about 2 minutes to fix the hinge, then I stood there and admired it for a while. After all, it's the only piece of furniture in our apartment that looks like it actually belongs. Nice! When the time comes, will you try to take this stuff back to the States? Oh shoot yeah. Everything I can get into the 75 cubic meters or whatever allowance my employer provides.